David Leveaux’s new production of Fiddler on the Roof, the beloved musical abouta Russian milkman and the traditions that bind his family in the tiny village of Anatevka, has garnered some unwarranted attention by the press.Some recent criticism has implied that the show is not "Jewish" enough or that Alfred Molina, one of the theater’s great leading men, can’t play Tevye because he is not Jewish.Both claims are outrageous and unwarranted and are an insult to working actors everywhere who each day transform themselves into characters from all walks of life. Leveauxhas reconceived the show for the contemporary audience, doing away with unnecessary schtick and musical theater histrionics.Instead, he directs a show for all people, one with universal themes about love, family and finding one’s self in a confusing and often cruel world. The breathtaking set design by Tom Pye underlines this theme.A large open space peppered with simple wooden furniture andbarren trees is backed by a deep blue sky of twinklingstars, as if to point out that we are all part of the universe, each one of us small and insignificant yet part of a larger cosmos. 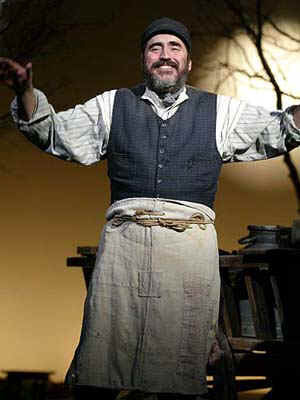 Molina is a refreshingly different Tevye.He avoids the overt Jewish stereotype and creates a fully human portrait, a milkman who is earthy, appealing andgood-natured.Molina commands the stage with his magnetic presence and booming voice, but he wisely avoids drawing a broad caricature. The power of this performance lies in the smaller moments and quiet nuances.He is not afraid to step back and let a scene happen without chewing the scenery or running over the other actors. Molina is at his best when patiently waiting with Hodel at the train station or singing a good-bye to his disowned daughter in"Chavelah." But he can also bring it on with the best of themas evidenced when hedances vigorously andrevelsin thelively number, "To Life." As Golde, the dependable Randy Graff is tough, full of sass and aterrific foil to Tevye.Her lovely singing voice nicely complements Molina’s gruffer sound.Both performers are younger than their predecessors and this works in unexpected ways; "Do You Love Me?" takes onnew meaning.It’s easy to imaginethe young couple they once were – now in their forties, a tough life has made them old soulsbefore their time. Thethree actresses playing the daughters, Sally Murphy, Laura Michelle Kelly and Tricia Paoluccio, are skilled and sing sweetly.Kelly stands out with her portrayal of the feisty, independent Hodel.However, it is the suitors to the three who almost steal the show.John Cariani’s Motel is a joy to watch–a natural clown, his wiry frame and edgy voiceprovideperfect comic relief. Robert Petkoff’s revolutionary Perchik is appropriately passionate, determined and hot-blooded. David Ayers shines as Fyedka,usually athankless role. While most revivals tend to show their age, Fiddler on the Roof holds up beautifullythanks tothe delicate and intelligent direction by David Leveaux.Hehas created a memorable production that showsexactly why Fiddlerisone of the theater’s most enduring musical classics.